Andrews Ross Sorkin wrote a piece for the NY Times that was just ridiculous. He put the blame squarely on the back of the CFO of FB. Talk about getting it 180 degrees wrong. It's easy to dump on the Facebook IPO as its stock price continues to fall and fall and fall. "Facebook messed up!" cries everyone. But did it really? Mark Cuban says no. Have you ever been to an auction where the selling party told a buyer to reduce their price because they were worried that the item might not hold its value? Neither have I. If the CFO of Facebook came on SharkTank and told me that he was able to sell his shares to the public for $38 a share, but turned down the opportunity, I would crush him for being an idiot. 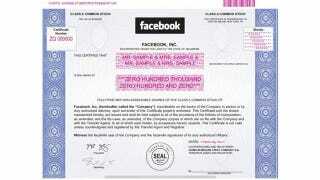 Facebook was able to raise about 10 BILLION DOLLARS in this IPO. The CFO's job is not to manage shareholder portfolios. His job is to help Facebook succeed. I don't know about you, but putting 10 BILLION DOLLARS in the bank in my opinion is one way to help it succeed. Whose job is it to help manage the portfolios of FB investors? If an investor doesn't manage their own portfolio, the brokers who sold them the stock are responsible. It's their job to read the prospectus if you as an investor are too lazy to do so. It is the job of the broker to help the investor understand the value of the company and make a buying decision. No question that there are a lot of brokers out there that did not do their jobs. As far as traders who bought the stock hoping for a pop: No one cares about them. Seriously. You trade, you know you are going to lose on trades. That is how things work. I bought and sold FB shares as a TRADE, not an investment. I lost money. When the stock didn't bounce as I thought/hoped it would, I realized I was wrong and got out. It wasn't the fault of the FB CFO that I lost money. It was my fault. I know that no one sells me shares of stock because they expect the price of the stock to go up. So someone saw me coming and they sold me the stock. That is the way the stock market works. When you sit at the trading terminal you look for the sucker. When you don't see one, it's you. In this case it was me. If the goal of the company is to maximize the cash obtained from the IPO, then the CFO should absolutely price the stock to maximize the return. If the goal of the company is to get a 1 day pop to make a PR splash, that is a completely different strategy. It obviously was not the strategy of Facebook. Facebook maximized the cash available to it. They have been very clear that they will not manage the stock, they will manage the company to reach the goals they have been very open and honest about. Good for them. Andrew did try to make one cogent argument that Facebook faced the risk of employees leaving because their options were underwater. Apparently Andrew forgot that companies can re-price their options. Problem solved. I will leave you with this article from a few years back when Google was at a similar point, having lost more than TWICE the market cap valuation that Facebook has lost to this point. Mark Cuban is the owner of the Dallas Mavericks, and one of the most successful technology investors around. He regularly blogs about the tech industry at Blog Maverick, and he has an ebook—How to Win at the Sport of Business—available at Amazon and iTunes. Oh, and he's on Shark Tank.